Whether at the office or anywhere in the home, sometimes a splash of color is needed to warm up your space. It’s totally normal to suddenly realize that your space is starting to lack vibrancy. Instead of embarking on a journey of deciding which accent color you need, why not go bold with the entire rainbow? To celebrate all things bright and fun, we wanted to share a colorful rainbow craft to dress up any room or space. 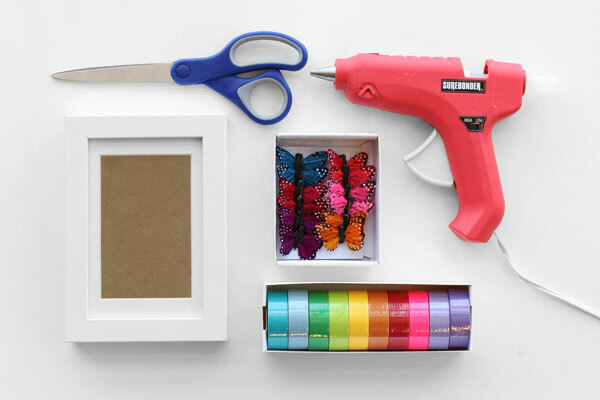 With just a few simple supplies, this extremely easy DIY picture frame craft is the perfect colorful project for any age! 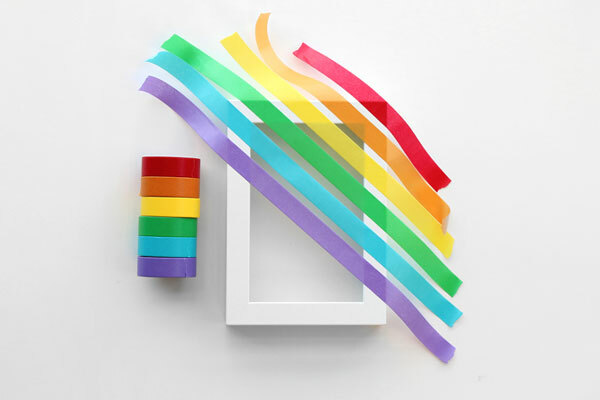 To create your own DIY Rainbow Frame, just follow these three simple steps below. 1) First, remove the back and front of the picture frame. 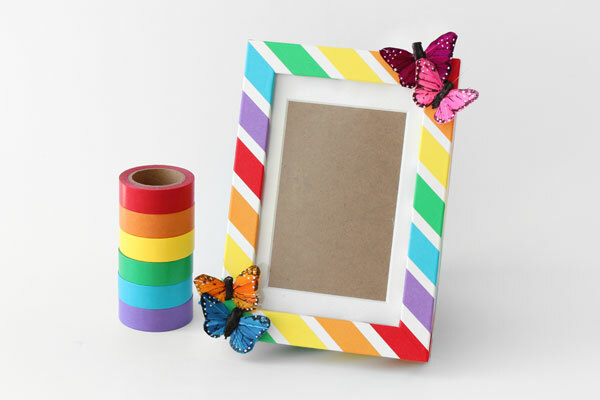 Then place the washi tape in a rainbow pattern across the entire frame. 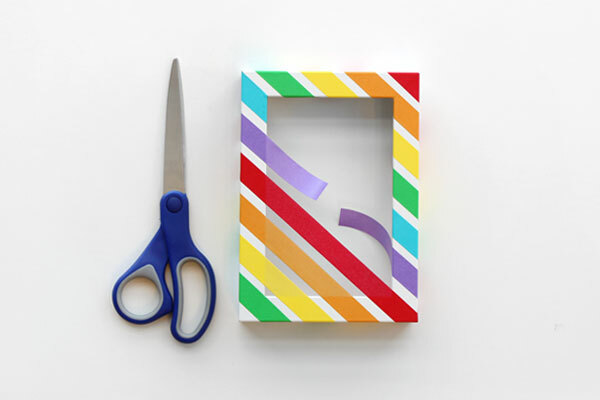 When placing each color of the washi tape, be sure to wrap it around the outside of the frame. 2) Once the rainbow pattern is complete, cut the tape down the center. Next, wrap the cut tape around the inside of the frame. 3) This colorful DIY rainbow frame is almost done! 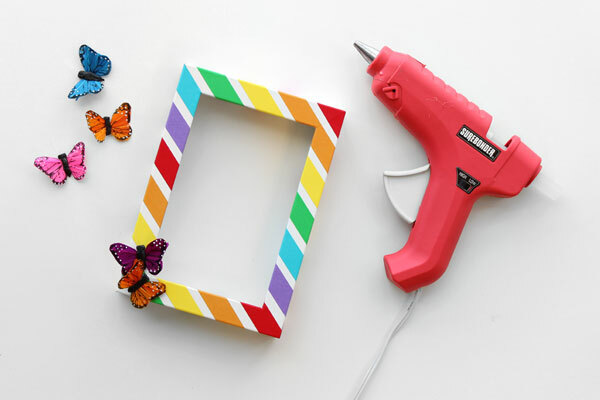 Just add a few decorative butterflies to make the frame stand out more using a hot glue gun or glue dots. With just a few steps, anyone can easily add a colorful rainbow accent to any room. Continue to keep following the Paper Mart blog for fun craft ideas throughout the whole year. Paper Mart offers a huge selection of affordable supplies such as washi tape, ribbons, embellishments, and more. Let us be the perfect one-stop shop for all your crafting needs! Great project, Emily! I always wondered what the washi tape was and what it could be used for. Thanks for posting this with such clear and easy instructions with photos. We are so happy you liked this post :). Washi tape feels like thin masking tape. Washi tape is made from natural fibers, such as bamboo or hemp and is functional as well as pretty making it wonderful for both every day and decorative use. Here is a link to ideas for washi tape: https://diyprojects.com/creative-ways-use-washi-tape/ Thank you!